K S Ravikumar’s Lingaa works only because of the charisma and enigmatic screen presence of the Superstar, says S Saraswathi. The Rajinikanth-K S Ravikumar association has previously produced such huge blockbusters as Muthu (1995) and Padayappa (1999). So, expectations were sky high for their latest venture together. Viewers expected another Padayappa, but, unfortunately, Lingaa is not in the same league. Rajini plays a dual role in the film and both his characters are called Lingeshwaran. Bollywood actor Sonakshi Sinha, and Anushka Shetty play his love interests. The film opens on a humorous note, with the younger Lingaa, a petty thief, in jail with his cohorts, Santhanam and Karunakaran. Lakshmi (Anushka Shetty) arranges for their bail. But she has an ulterior motive. She wants Lingaa to accompany her to her village. Though Lingaa is reluctant, he is later forced to travel with her. It is here that he learns about his grandfather, King Lingeshwaran. The film goes back 70 years, to the pre-independence era, when the country was under the British rule. The village of Solaiyur faces extreme water shortage. The dry lands force the farmers to commit suicide. Deeply affected by their plight, the King decides to build a dam for his people. But the British are not happy with this. They are desperate to prevent him from succeeding in his plans. Can the King eventually fulfill his dream? What is his fate? Why is the younger Rajini called back to the village? All these questions are answered in the second half. The music by A R Rahman is not very impressive. But cinematographer R Rathnavelu has captured some magnificent scenes. The much-hyped train fight scene has been brilliantly shot and so have some scenes of the dam. Unlike the Rajini-Dipika fiasco in Kochadaiyaan, the Rajini-Sonakshi combo works like a charm. Sonakshi has given an admirable performance, and so has Anushka. Santhanam attempts to provide some laughs, but Rajini’s perfect comic timing overshadows his performance. 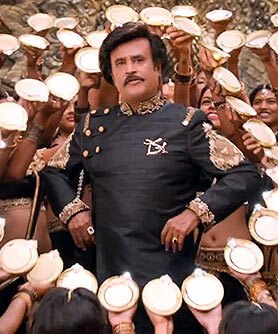 Rajini dominates every frame, thrilling his fans with his electrifying screen presence. He appears far more energetic and lively than in his recent films. You find glimpses of the old Rajini in many of the scenes, but in others, the make-up seems too loud and obvious. Lingaa follows the standard Rajini template. Director K S Ravikumar has ensured that the fans have plenty to cheer about. Rajini is stylishly dressed, complete with dark glasses and leather jacket and walks with the swagger that is unique to him. The film is packed with philosophical punch lines that are greeted with thunderous applause and ear-piercing whistles. The second half of the three-hour-long film is quite tedious. The biggest drawbacks are the uncomplicated plot, Ravikumar’s direction and the highly dramatic and exaggerated climax that is too hard to digest. Rajini has proved innumerable times in the past that he can carry the burden of an entire film on his shoulders, and he does so again. K S Ravikumar’s Lingaa works only because of the charisma and enigmatic screen presence of the Superstar.